“When I came to Spain and I saw people partying, I thought to myself: ‘What the f***? 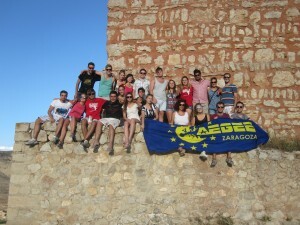 !’” The lyrics of the song by Sak Noel, also often called ‘the most annoying song of all time,’ are a very precise description of the first feelings of many of the participants of AEGEE-Zaragoza’s Kingdom of Dragon vol.3: ART – ATTACK. Thanks to our amazing organizers, we were able to see the beauties of Aragon at the same time as experiencing the real Spanish lifestyle with everything that it includes – Spanish timing (for once in my life I wasn’t late! 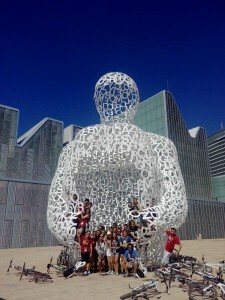 ), Spanish food and the never dying urge to party – all day, all night. As soon as we finally get ready (luckily, five Spanish minutes are about an hour on my Swiss watch which I consider an authority on the topic), we leave our flawless accommodation to explore the neighboring area. I will be honest. When applying, I had no idea the region of Aragon could possibly be as gorgeous as it is. As a regular European citizen and a new AEGEE member, my knowledge of Spain was limited to Madrid, Barcelona, Valencia, Bilbao, and the words used in the lyrics of the song “Salsa, tequila” – taco, Shakira, nachos, sombrero, mojito and above all, Antonio Banderas. But the less I knew about the region, the more I found it astounding. Our TSU started in Zaragoza, the capital of the region, and a city which was formed by a mix of Christian and Arabic culture. As a result, it nowadays boasts a cathedral with a stunning combination of the original colorful Muslim architecture with the later Christian towers, as well as Aljafería – originally a palace for the city ruler which is now the official headquarters of the Aragonese parliament. Zaragoza also has a great party-friendly city center where you can get very cool shots for just one Euro, but I don’t even know why I’m telling you this; of course you’re way more interested in analyzing the architectonic styles of Zaragoza than spending your time in a bar! The next stop on our trip was the great city of Jaca – the gate to the Pyrenees, the mountains dividing France and Spain (and Andorra, of course, I would never forget that!). Our trip to the actual Pyrenees was unforgettable, with our SU splitting into two sub-groups – officially the ‘slow’ group and the ‘fast’ group, factually the ‘hangover’ and the ‘not-so-much-hangover’ – and enjoying the green flowery fields all around us, that magically transformed into rocks at the end of the horizon. Walking through the canyon with a crystal-clear river floating next to you, just waiting for you to soak your tired feet in, so as to let the cold water flow give you a refreshing boost, felt like walking through paradise and let us all forget about the alcohol our bodies were fighting. Lastly, once in Spain, you have to enjoy something connected to the Catholic Church. During our last stop, the beautiful village of Albarracin with its red brick houses, marvelously matching the scarlet hills on which it was built, we were staying at a priest’s house who granted us with his visit one day and decided to play us some songs to cheer up weary souls. 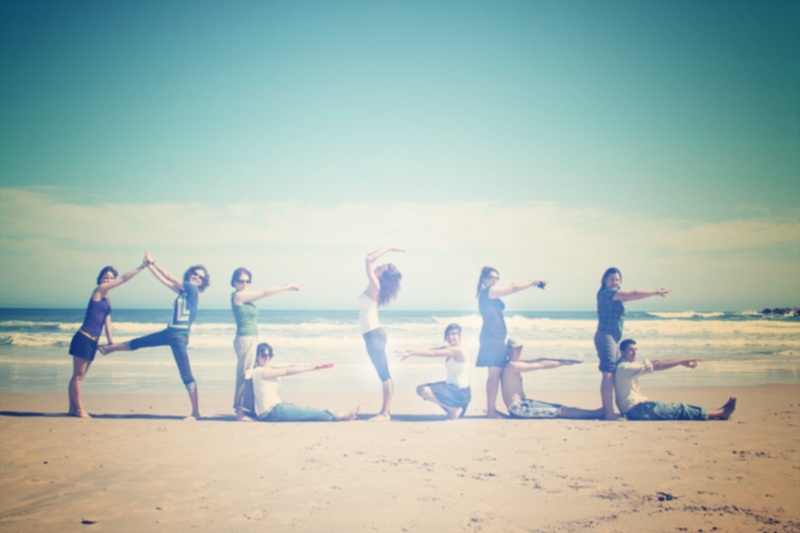 This idea was really sweet but at the same time, the situation somehow became so comical that one of the participants (the BEST participant, actually!) almost suffocated suppressing his laugh. 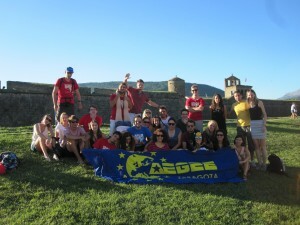 And that is the spirit, that is AEGEE! You may travel on your own and enjoy the beauties of any given region but there are memories of your SU which will clearly make it prevail over your other trips. It is when you team up with your Slavic friends trying to prove to the world that the Slavs can drink the most while desperately attempting to understand each other speaking their native languages (because all Slavic languages are alike) or when you scream “Contigo no, bicho!” with your favorite organizer in a random Spanish club in the middle of the night just for the fun of it, when you feel truly happy to be a part of the European family, and above all, a part of AEGEE. Traveling is always nice and exciting but with the right people, it becomes a whole new experience. And this summer, the Kingdom of Dragon had the best people it could possibly get. ← Torino Summer University Use your TOngue 2.0.